Mason Tyler earned both the event and Round 2 wins with his 85.5-point ride aboard Space Plane at the WIlkes-Barre Classic. Photo: Andre Silva/BullStockMedia.com. WILKES-BARRE, Pa. – Mason Tyler (Maypearl, Texas) captured the first PBR (Professional Bull Riders) Real Time Pain Relief Velocity Tour (RVT) win of his career Saturday night, victorious at the Wilkes-Barre Classic, the tour’s first-ever event inside Mohegan Sun Arena at Casey Plaza. The Texan led the draw in Round 1, covering Dream Catcher (CBT 4/Wallgren Bull Co.) for 86.5 points. In the championship round, he brought the crowd to its feet with an 85.5-point ride on Space Plane (Mike Miller Bucking Bulls) to conclude the event, earning him both the round and event win. In addition to earning $7,400 and 120 world points, Tyler has also earned an invite to the elite 25th PBR: Unleash The Beast US Border Patrol Invitational in Fairfax, VA on September 22-23. Cannon Cravens (Porum, Oklahoma) finished second, collecting a paycheck for $5,100 along with 70 world points. 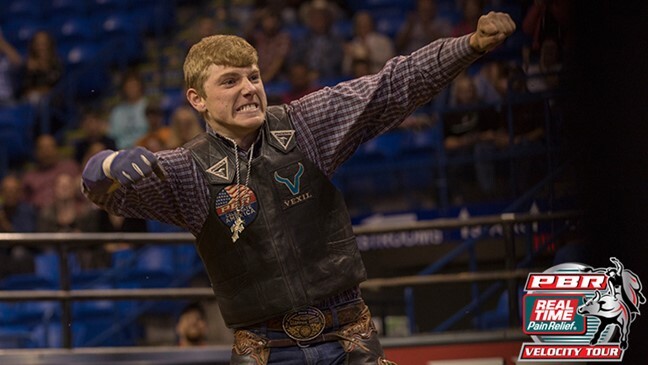 He was propelled to the runner-up finish compliments of his 85-point and 82.25-point trips aboard Mike Miller Bucking Bulls’ Hair Trigger and Savage, respectively. Third place went Michael Lane (Tazewell, Virginia), the final rider to deliver a perfect 2-for-2 performance. For making the 8 on Biscuit Snatcher (CBT 3/Barrett Willis Bucking Stock LLC) in Round 1 for 78.75 points, and Against The Law (Mike Miller Bucking Bulls) in the championship round for 82.5 points, the 28-year-old earned $3,100 and 40 world points. Daniel Tinsman (Farmland, Indiana) finished fourth, backed by an 84-point effort on Uptown Funk (Rio Vista Rodeo & Equipment) in the opening round. He leaves the Keystone State with $2,000 and 20 world points. Rounding out the Top 5 was Casey Kirwan (Mendocino, California), whose 83-point trip on Comanche Moon (Championship Pro Rodeo / Cude Energy) netted him $1,140 and 15 world points. Dirty Dan (Barker Bulls LLC), Eye of the Storm (Bob Whisnant/The Johnstons) and a pair of bulls from TCB Ranch/K-C Bucking Bulls, Ram Itand Show Me Homie, tied for the high-marked bull of the event honors after recording matching 43.25-point bull scores. The Real Time Pain Relief Velocity Tour next travels north for the Portland Chute Out, in Portland, Maine. The two-day event begins on Friday, September 14 at 8:00 p.m. ET, and concludes on Saturday, September 15 at 7:00 p.m. ET.